This is what I found on the kitchen counter, sitting beside my fuel stash, on race morning. My husband is the sweetest, ever. 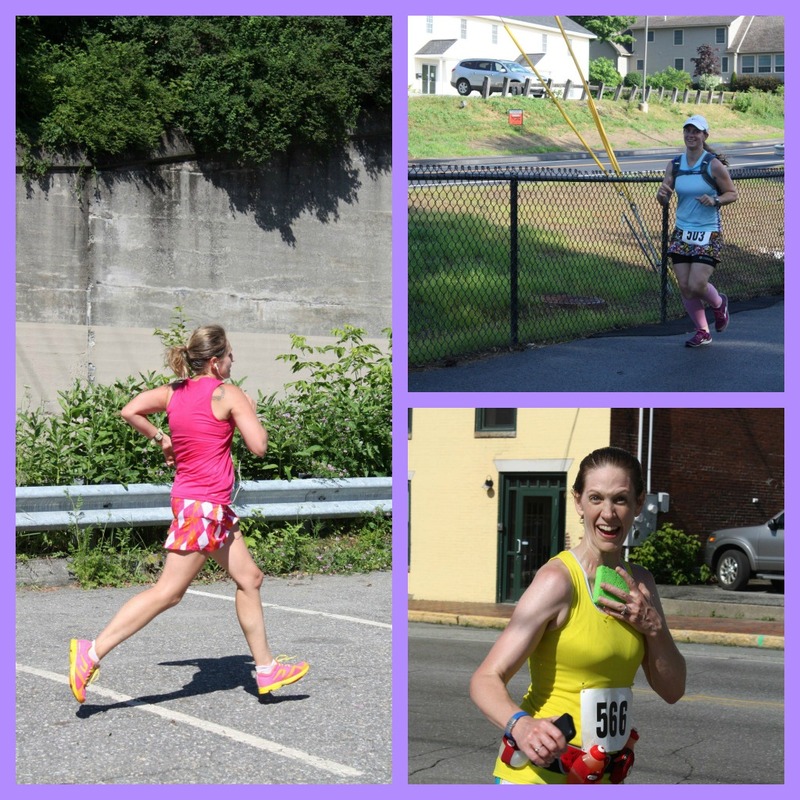 Yesterday was my sixth half marathon and my second KRRT half marathon. Jill and I were at the start bright and early and ready to rock. I have issues. Apparently, in my mind, it made perfect sense to pick Jill up at 6:30 (with the race starting at 7:30) for a 10 mile drive AND we had already picked up our bib #s the night before. Jill knows me well and we waiting for me when I came around the corner. When we got there, we finally got to meet Michelle from Average Girl Doing Average Things, a local blogger and fellow Tough Chik. It was great to finally meet her in person. I can't wait until we can meet again. Eventually we headed over the starting line to get ready to run. The race was supposed to start off with the firing of a musket, but after two misfires, the race director shouted go and we were off. I felt great, so I went with it. For about two seconds I was ahead of my running pal, Leslie. Then she passed me like I was standing still, holding her iPhone up every so often to take pictures. Now that's talent, people. I tried like hell to keep her pace, but I lost her in no time. Mile 1 split - 7:34. Mistake #1. Eventually I evened out the pace and felt great for the first 8ish miles. I got to see Ward and my kids, then Wade and my niece and nephew, Stacy and her daughter, and then my dad at the turn-around. The husbands also had a great plan in place - they went out the night before and bought ice and sponges so they could offer us the relief of something icy cool on the run. They are THAT good. I had love and support every few miles. Perfect. I know. Of course I'm smiling. Just after I saw Stacy for the second time, I ate my favorite GU, peanut butter. Within seconds, I felt sick to my stomach. (GU = Mistake #2) I wasn't sure if I was going to throw up or poop my pants. My rocking pace came to a halt. To be sure, I made a pit stop in the woods. I tried and tried, but I could only pee. I guess that was good. Side note: I had passed a few port-a-potties at this point and the next one wasn't for another 4 miles. To be honest, I know this trail very well and I am fairly confident that I know where the "good spots" are to go and relieve myself. TMI, I know. The pee stop helped a bit and I was able to trudge along for the next couple of miles until I came out of the wooded section and into the cute little town of Hallowell. I was praying that Ward was going to be where he said he was going to be, with those glorious sponges. When I saw him and the rest of the incredible support crew, I thought I was going to burst into tears and tell them to just take me away. Somehow I held back the tears and instead of showing gratitude for their generosity, I blurted out some swears about crapping my pants. Classy, I know. I really wanted to eat that sponge. I was so cold and felt heavenly. The quick refresher helped me surge through survive the next 2 miles. The plan was for me to hand off my camelbak to Ward at this point, but I didn't dare to do it. I needed that water and quite frankly, I was surprised I had any left. The final section was through another wooded section and I was thankful for some of the shade it offered. I swear it felt like it was 100 degrees. I continued to sip from my camelbak. Knowing this course inside and out, helped quite a bit because I knew when to throw whatever I had left into high gear (which wasn't a whole lot but better than nothing) and get to that finish line. Mile 1 - 7:35 ---what was I thinking??? Mile 10 - 8:32 - is it ever going to end? Final time - 1:47:55 (8:15 pace). Not my best, not my worst. 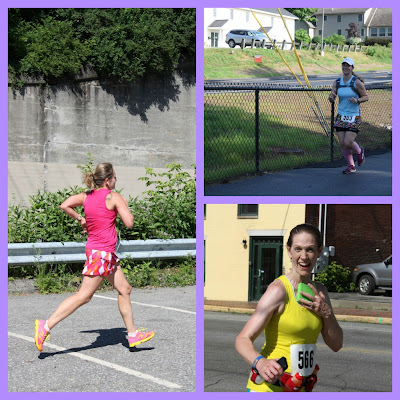 Part of this race was dedicated to Toni's Running, Loving, Living Virtual 5k/10k - I think this race qualifies for both, don't you agree? I just wish there was a medal for this race. I know, I know. There wasn't one last year either and I shouldn't expect one, but it IS a half marathon. That's quite an accomplishment. I'd love it if the KRRT designed the medal to be something similar to the sticker they had in our goodie bags (hint, hint). I definitely learned some lessons during this race. Half Marathon #6 down. 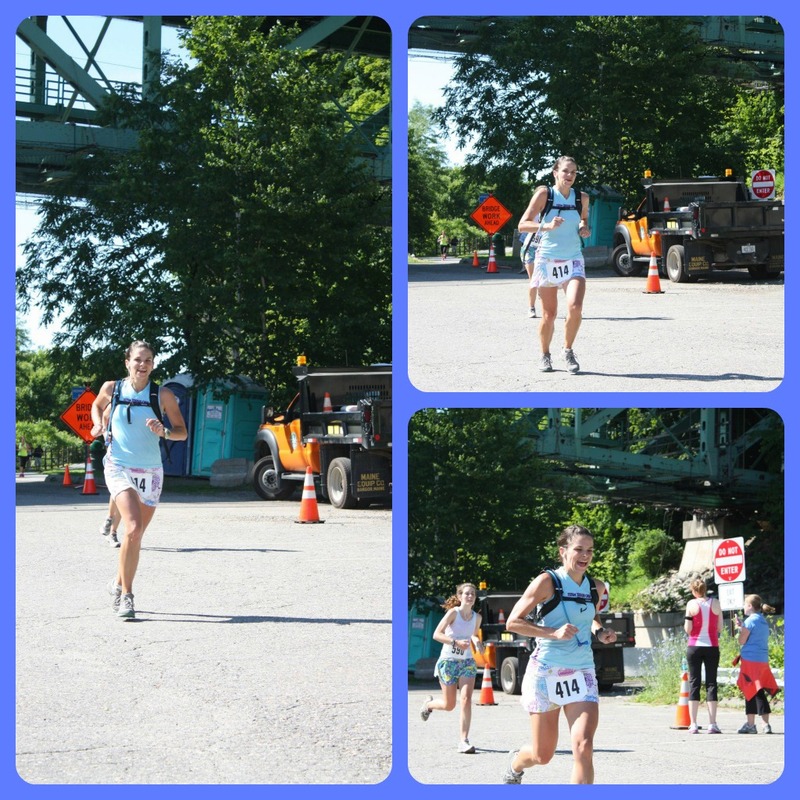 Next scheduled race - LL Bean 4th of July 10k and then nothing (scheduled at least) until MDI Marathon October 14th. 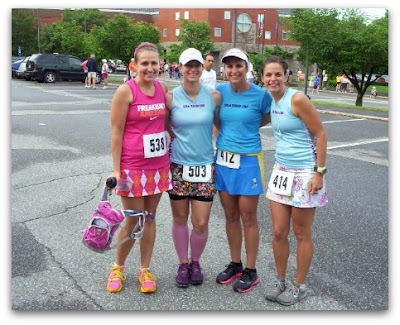 I also love that I got to see these fine ladies once during the race, since it is an out & back race. All three did a might fine job and I am proud to call them my friends. 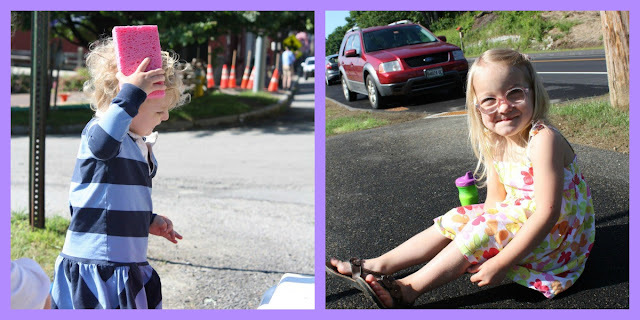 And a race wouldn't be a race without the support from some adorable cuties. Apparently Scoutie was hot too so she took part in the sponging as well. And Addie, well, she is just too adorable! Izzy was there too, cheering me on, but didn't pose for Stacy. Great race, Jen! Love the photos! GU kills my belly too. Blech. PB GU never killed my belly but it was during training runs. I thought it was only the caffeinated GU that killed me. This is twice on the same course I got sick from GU. I'm done with GU forever. Too bad I have an huge stash of PB GU in my pantry. Ugh!!!! I am quite fortunate to have an incredible support team. We support each other so much - lots of love and support in our little group. 5. I may just never try Gu!! 1. 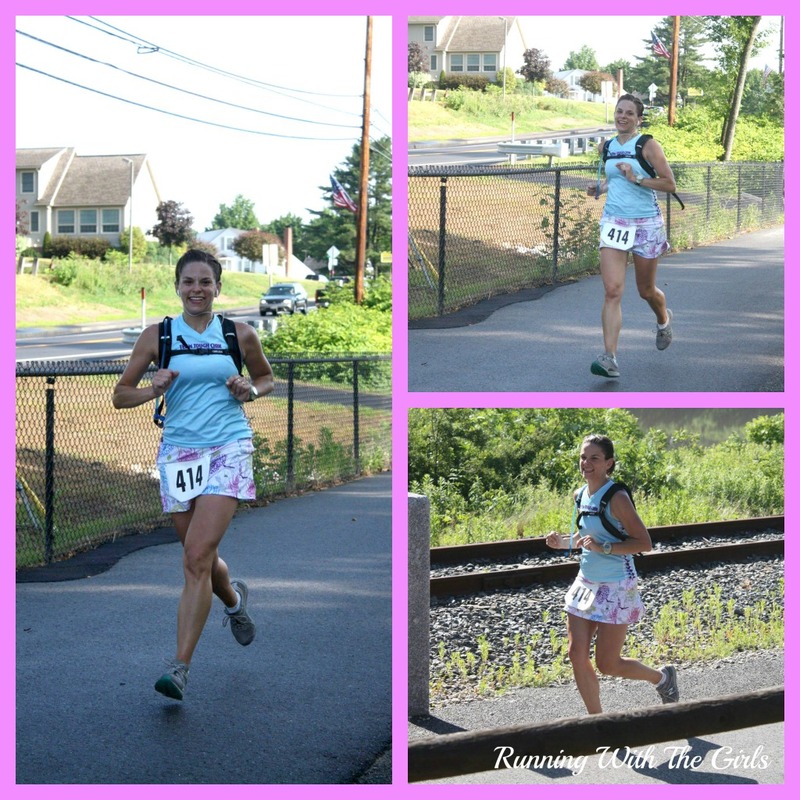 It is my most fave race outfit! 2. He was quite concerned but that was after a whole slew of naughty words came out of my mouth - especially in mixed company = not good. 5. Peanut butter GU has been great on training runs - apparently just not my friend in a race/heat. not to make this about ME :) but I do wonder if Id like TRAIL RUNNING better?? Thanks! Running does make me happy (well, most of the time). I'd say those three pictures with my husband - I definitely was not happy. But powering through that moment of weakness made me happy for sure! Great race, congrats! You ended up with some great photos in that first group too thanks to your photographer. Love the note from your husband - that and the sponges definitely makes up for no camera! Thanks, Abbi! Yes - my photographer rocks. I wish she would have run but at least she was there with her support and camera. & it definitely helps having a husband who has recently run two marathons in some blazing heat to know what will help on a hot day/race. You are my idol. It was a tough in the heat, but we did it! And thanks for all the wonderful food after! Sorry we had to run out so fast, I feel bad about the tornado that my boys caused through Izzy's room! Took a sec away from moving stuff to say a very big congratulations! For not being your best race you sure had an fantastic time. How do you look so gorgeous when you run?! Glad you like the new header. I was playing around with PicMonkey. It will work for now. The other picture was too fuzzy..... :) Thanks! I loved your recap! I'm really interested in trying Honey Stingers because GU scares the pants off of me. You've piqued my curiosity! Thanks Amanda! Honey Stingers are so much easier to digest. I just didn't have anymore on hand. I must get a ton of them for marathon training! Def. good you have concluded that GU is not for you on race day... race day is like a holy day, don't do anything different and don't poop your pants. Yes, that's how I celebrate a holy day. Great race and great attitude. All things considered, your splits were pretty spot on. Great recap and fun photos! 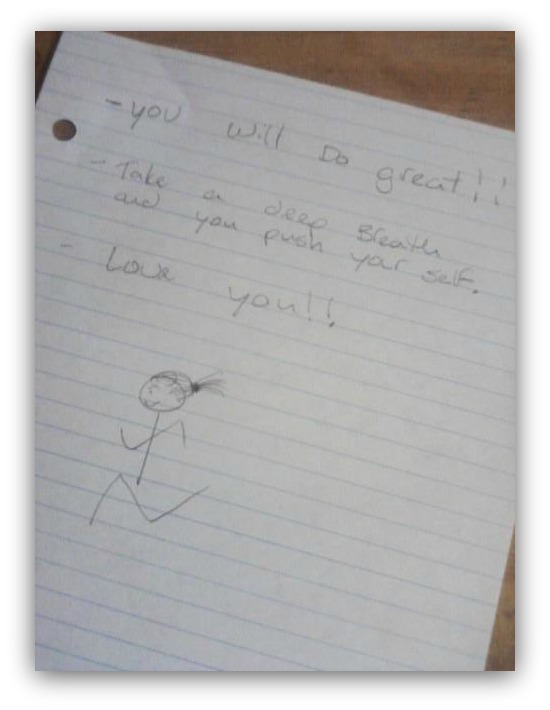 That note is precious! And the race looks awesome...I haven't done a race since March and I think I miss it! Time off from races has it's advantages for sure. I feel I crave race day more when I space them out a bit. :) and I do love that note. Little did he know it was going to be plastered all over the web. Poor guy. Great report with great pics! Always nice to have solid support at something like this. Sorry about the GI issues. That's a bummer for sure. You are a rock star for powering through! I am quite lucky with the support team for sure. I feel bad for the runners who have nobody there for them. But somehow they get through it as well. Great job Jen! I love that you learned something from this race, I definitely have to work on #3 (although most of the time that is taken out on Mike if/when I see him on the course or finish). Love all of the photos! These are great photos from the race Jen! Stacy did an amazing job as your race day photographer.